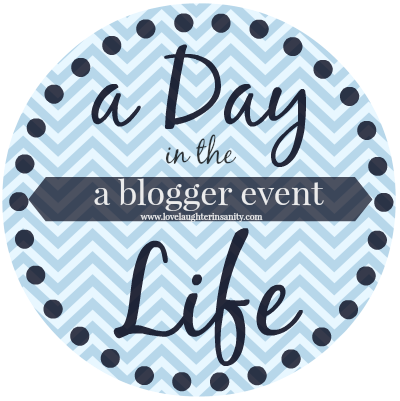 Tomorrow Trish of Love, Laughter, and a Touch of Insanity is hosting "A Day in the Life" event, encouraging bloggers to share one day out of their lives with each other. I went back and fourth on how to do it, tried taking notes of my day, laid it all out on paper and, well, it is really rather dull. I thought of telling you about a weekend day as those are the days the family is all together--Saturdays are for soccer, the park and library visits and Sunday are often our lazy days--but my narrative took me in another direction as I began to write. I did not think I would have much to say, regardless. On a work day, I get up while it is still dark outside (around 4:30 a.m.), sometimes after pushing snooze, sometimes not. I kiss my 4 year old sleeping daughter and husband before heading downstairs. I am supposed to work out first thing, but I haven't been good about it lately, I'm ashamed to say (I need an injection of self-motivation). If I do work out, I go back upstairs to shower, and then come back down to eat breakfast. When I do not work out, I sleep in a little longer (or catch up on the Walking Dead if it is Monday). I enjoy the quiet time of the early morning. I feed the cats and give them some attention. Sometimes I squeeze in a little reading or listen to an audio book. More often than not, I catch up on e-mail or Facebook on my phone. I don't have much time before I have to rush out the door to work, which is about a fifteen to twenty minute drive. I love the drive. I have an uninterrupted view of the sunrise these days, as it peeks out from behind the distant mountains. Of course, if I am running late it means the sun is right in my eyes. I try not to be late. There's no rushing around to get my daughter ready. My husband does all that. He starts work later and is the one responsible for getting himself and our daughter up, dressed and out the door for work and school. I rarely see either one awake before I leave for the office. My work day involves a lot of paperwork, consultations, computer work and talking on the phone. There's the occasional meeting. I could tell you stories . . . But, really, I can't. I work with sensitive and confidential information. Some days are harder than others. I generally like my job and the work I do. I work with a great group of people. I'm known for bursting into song at any moment and for my dry sense of humor. I am also the queen of the non sequitur. My coworkers and I find laughter where we can. It helps balance out the days that are heaviest with bad news--the death of a child or another tragedy or something more than the usual crisis intervention we deal with every day. I never take my breaks, but I nearly always take my lunch. I need it for my mental well being, if nothing else. The quiet time recharges me. I work ten hour shifts, sometimes longer, which make for long days. My job is harder now that I am a parent. 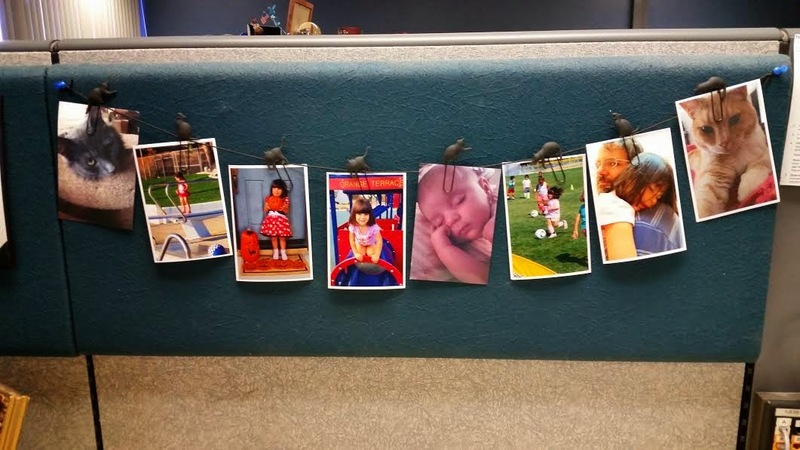 The stories I hear and deal with at work have never been pleasant, but as a parent it's gotten harder to not think of my own little girl--to put her face on the abused and neglected children I hear about. I say this not for sympathy or anything like that. It just is. I am lucky to make it to my daughter's school/daycare in time to pick her up before closing. Just barely. I am the luckiest mother alive to have found such a caring daycare provider and teacher. I trust her completely, more than I do my own mother and mother-in-law. I dread the day my daughter goes into kindergarten and has to start somewhere new. Right now, she's just a mile, if that, away from my office. But my biggest fear is putting her with someone else, someone I don't know, while I am at work. With the type of job I do and the stories I hear, I do not trust easily. Yes, so, I will definitely be one of those overprotective parents. As I drive to my daughter's school, I often wonder which side of my daughter will greet me that day: a happy girl or a cranky one. Usually it's both. She's always happy to see me, running to give me a hug (except on the rare occasion she doesn't because she's too busy playing). I got into this bad habit early on of letting her play awhile before we leave. I could blame my daughter's best friend's mother as I was only following her lead when Mouse was old enough to walk and voice her own opinion. The best friend's mother is who I wish I was as a mother. She's always so patient with her daughter. I have never heard her raise her voice other than to call across the yard. She always sits with her daughter when she first arrives, talks to her and asks her how her day went. She offers these perfect little lessons to the children, knowing just what to say, right on their level--like when breaking up an argument, helping them express their emotions, encouraging them to share, etc. She's always got these great ideas for projects to try. She really isn't perfect, of course. I know this and I know I shouldn't compare myself to other mothers, but I still find myself wishing I was more like her. I couldn't sit Mouse down and talk to her when I first arrive at her school even if I wanted to. Mouse is too quick to hug me and then run off to play some more. She sometimes comes back for me, wanting me to play with her too. If I try to ask her about her day, she's quick to redirect the conversation back to her game. I don't push it. I let her play. Sometimes we sit and draw together. Most of the time, I really don't mind. It helps my brain shift from work to home and I enjoy interacting with my daughter and her friends until the other parents arrive. I think her teacher appreciates the chance to talk with adults for a bit, even when we're all still there a half hour after closing (sometimes she is the reason we stay so late). Most days we play in the school's front yard, Mouse or her best friend often convince some other child and their parent that playing in the "meadow" is a must before anyone goes home. Us parents often joke about how the children spend all day together and yet they act like they haven't seen each other all day. They cry when it's time to go. Mouse and I are ALWAYS the last to get in the car to go. Sometimes she goes easily. On others she fights me. Cries (although less of that now that she's getting older, thank goodness). Pouts. Runs away. Hides. I tell her if she doesn't get in the car by the time I count to five she won't get to watch television when we get home. That usually gets her to cooperate. When it doesn't, I keep adding to the list until I've lost all patience; I worry about the day she's too big for me to pick up and carry to the car, her hugging me and pouting. I always follow through with my threats if she doesn't cooperate--and, of course, that brings on tears once we get home, and she realizes I was serious. Most recently though, I've taken to sitting down on the school's front lawn beside her when she clearly isn't ready to leave after everyone else has, and she'll climb into my lap. We sit there and look at the sky--and finally she'll talk a little about her day. By the time I force the issue of leaving, she's more ready to go. I don't know if this is the best way to handle it, but I prefer the more peaceful approach--and it isn't like we have to rush home, not really. Mouse doesn't often talk to me on the car ride home, at least not at first. I try to engage her, but she's often lost in thought looking out the window, sucking her thumb. I find the most likely way to draw her out is to tell her about my day, about the people I "played" with and who might have been sick or feeling sad that day or maybe who won an award or was extra helpful. She'll then ask me questions and express her concern, if appropriate. Maybe she opens up about her own day more. Yesterday, in fact, she told me she told me she couldn't tell me about her day. With a little more prodding she told me she couldn't tell me or her teacher that one of the girls at her school hit her. Her friend was mad because Mouse had told her she had a secret and wouldn't share it "because then it won't be a secret." *Sigh* It can't be easy, can it? I wasn't too excited about having this conversation in the car. We did talk though. About her being hit, about her not wanting to share with me what happened, and about secrets (which, by the way, is a concept she doesn't really understand--we're working on it). Sometimes on the car ride home we sing. My daughter's current favorite songs are Roar by Katy Perry and Shake It Off by Taylor Swift. I love it though when we sing songs together that she learned in school or that I taught her (all those old camp songs which still come in handy after all). When she's first trying to learn a song, she will have me sing it over and over until she can sing along. Let's not talk about this past Monday when I got distracted and did not buckle her into her car seat, only for her to tell me when we were half way home, on a stretch of road that was hard to find a spot to stop. "Look, Mommy! I can get out of my seat by myself," as I catch sight of her leaning forward to point out a bag of garbage in the middle of the road, and tell her quite firmly to sit back in her seat. I won't mention that when I got out of the car, I left the car running, ran around to her side to buckle her in and couldn't open the door. Or the front passenger door. They were both locked. I will skip the part about how panic filled me as I saw my cell phone on the passenger seat, just out of reach, and I wondered if I would have to flag down a car to stop so I could call my husband for help, all the while my daughter locked inside a running car. The images of all possible disasters ran through my mind. I ran around to the driver's side, and fortunately it was still unlocked. I felt a huge wave of relief. My daughter, once she was all buckled in and we were on our way again, said quite calmly, "We won't be doing that again, will we, Mom?" No, baby girl. No, we won't. We laughed about it, and, of course, she told her dad all about it that evening. When we finally get home, Mouse will want to stand in the driveway for awhile, maybe run up and down it before wanting to open the door to the house all by herself. What happens next varies, with the exception of always asking for a snack and juice. We talk more about her day. 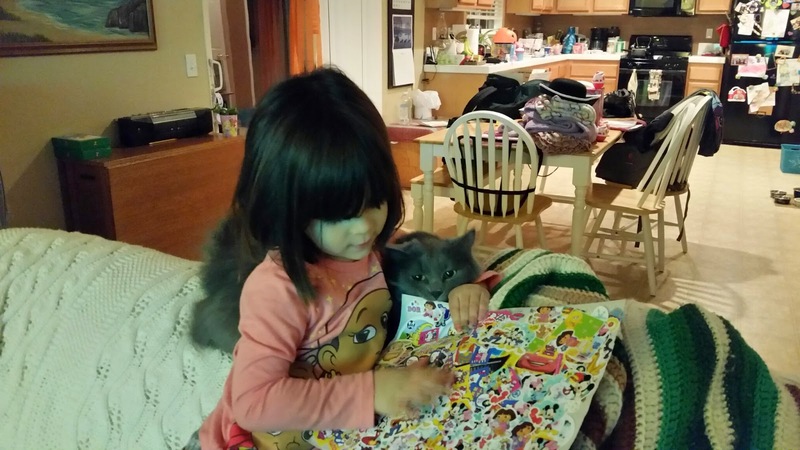 We take a closer look at any art work or worksheets she brought home. Mouse helps me unload the dishwasher or load it, depending. She likes to help me change the cats' water too. Sometimes we play dress up or pretend. Or do a puzzle. On days when I am just too tired, I turn on the television and we watch cartoons together. Mouse likes to cuddle up next to me, climb on my lap. She doesn't like to sit still, but she has to be touching me, somehow. And with that, of course, everything is right with the world. At least until I tell her she cannot have the cookie she asks for until after dinner or she gets mad because I won't let her linger outside longer or I am not doing just what she asked me to in our game of pretend. It's clear she's tired at that point, overstimulated and cranky. There are sometimes tears and screaming. In the worst moments, my nerves are frayed, if they weren't already, usually because she gave me a hard time about coming home as well. At those times, I am losing my patience and my husband is racing home to rescue both of us from each other. In the best moments, I redirect her and she is able to let go of whatever made her mad in the first place. Or we may talk about what made her mad and work through her emotions. Often, she just needs a hug and reassurance that her world isn't falling apart, and to know that I still love her. What I'm thinking though is that she needs to eat and sleep. At around 8:00 p.m. on a good night, later if it's not, there's bath shower time (God forbid it is hair washing night because that is sure to bring on some tears), and maybe, if she's lucky, a little more television time before Mouse's teeth are brushed. Or perhaps a game with Daddy. Then it's story time and sleep. Finally. Only . . . Bed time is not always easy. It can be a fight to get her upstairs to take a bath shower, and to get her to brush her teeth. It's a fight to get her into bed. Not every night. But many nights. Sometimes their are tears. Often there are attempts at procrastination. She can be quite creative in that regard. Mouse rarely does anything at top speed. She meanders and takes detours. We try to be firm and sometimes scold when it goes on too long. Somewhere in all of this my husband takes over, and I sneak away. Maybe to shower and often to read a little before bed. When Mouse is having a good evening, I enjoy the peace and quiet. When she isn't, well, I struggle with going to her when she cries for me or just letting her dad handle it. I kind of use him as my litmus test in what to do. If he's feeling frustrated, I rescue him. As strong as the urge is to run to her every time she calls me, I am not sure it's the best idea. I feel torn between wanting to meet her needs and help her feel secure and in wanting her to be independent and not rely on me so much. Mouse does not seem to mind getting into bed. Maybe because it means cuddling with me. She nestles up close and closes her eyes. Then they pop open as does her mouth. She has more to tell me about her day. As tired as I am, try to tell myself to enjoy these moments. Be glad she wants to talk to me. It can be hard though, given how early I have to get up in the morning, as drained as I am. There are times I send her off to her father, the night owl, who lets her watch him play a game or read on his computer. Then there are the moments when I hate myself, when I tell her through gnashed teeth to "Please, just go the sleep." To be fair, sometimes I ask Mouse questions and encourage her to stay awake just a little longer. Sometimes I stick my leg high in the air and she does too. We touch our toes. We share nose kisses. We giggle and laugh. I suppose one can fault me for being inconsistent in keeping to a strict routine. Regardless, I always, always kiss her and tell her I love her and to have sweet dreams. Most nights she falls asleep first, and I drift off after. And that's a day in my life. More or less. There is a lot that is the same about your routine and mine. Mine posts tomorrow. It's made me a little depressed just how little of the day is spent doing anything of value. Ti - I think I was most depressed by how little time I spend with my husband, but, yeah, I know what you mean. That's quite a day! Mouse is lucky to have you and your husband! Jenclair - That's nice of you to say! Kay - She really is her own person, that's for sure. She's such a delight. And soemtimes a headache. LOL I do love her. Thank you for your kind words--and the hugs. Her teacher and I had a long talk yesterday--I guess some of the older girls (all of 5 years old) are having some issues. Mouse hasn't picked up their bad habits yet--but she tends to play with the older kids. Some of that "girl" attitude and behavior I have to look forward to dealing with . . .
What an adorable photo of the two of you! And that is a busy day! I could write one of mine too, but sadly, it isn't quite as eventful. That is surely bound to change once our little one arrives though. Thanks for sharing this post - I loved reading it! Yes, big changes are in store once you have your little one. Some of those changes are more difficult than others. I am glad to have Mouse in my life though and I am sure you will feel the same. This is a lovely post, Wendy! I enjoyed reading it and hearing how you interact and bond with Mouse. I think it's a great idea of writing this so when our children grow up, we have these notes to remember aside from the pictures. Melody - Thank you. Mouse is so much a part of my every day even when I'm working and can't be with her. PS. I have the same cat figurine. I love it. Nicole - Thank you. :-) I think that was taken not long after my surgery. I'm surprised it turned out so well. Yes, motherhood can be very challenging. I don't always feel as if I was cut out to be a mother, but I wouldn't trade this experience and Mouse in for the world. I can't imagine how difficult it is to do the work you do and still be a parent as well. We have some of the same challenges I think. Leaving is rarely easy and bedtime is always a battle of wills. I love how much you talk about your interaction with her. The idea of sitting and letting her settle down when you don't have to rush home is a great one. I'm really bad about feeling tied to a list and not rushing when I truly don't need to rush. I love the picture of the 2 of you! You both look so happy! Katherine - I know what you mean about being bad about feeling tied to a list--I have to remind myself that there's nothing at home that can't wait. Well, maybe the cats. LOL Now that she's getting older though, she's able to better express herself and I'm noticing little things like her sigh or look of disappointment when I tell her "not now" or something like that. It's made me more conscience of being there for her and that other things can wait. Wendy this is a lovely post, thank you for sharing it with us. I admire you for what you manage to do in a day, and I hope if I ever have a child I will have a relationship as good as yours. Wow, that is some day. But 4.30? That's the middle of the night. I used to have a home daycare and it was AMAZING how, no matter how much a child might miss Mom throughout the day, as soon as she showed up he didn't want to go home. *LOL* I know it's just that transitions are difficult at that age, but holy crap. One little boy would always tell his mom "NO! I JUST STARTED having fun!" as if he'd been sitting on his hands all day and hadn't played one bit. I used to work in human services too, and yes -- it all becomes so much more raw and painful after you become a mom. Irene - Ah, thanks! Your comment means so much to me. Yes, we are truly blessed. I think wanting to be as honest as possible is what made it hard for me to pick just one day to talk about. It was bound to be the perfect day, and I wanted to offer an idea of just how wonderful and stressful it could be all at once. By far I am not perfect, but I hope I am good enough for my daughter. If that makes sense. And I see you know what I mean about work and how it's harder to keep it from affecting us. I swear my emotions are much more on the surface now than they ever were before I had a child. It was easier to distance myself from my work. I can imagine you saw quite a bit when you ran your daycare. Kids not wanting to walk in the door, crying as their parents left, and then not wanting to leave. My mom used to run a home daycare too--although I was too young to pick up on stuff like that then. I swear parenting is the hardest job of all. Sounds like you're handling things well, even on difficult days. I loved your post Wendy. Being a working mom is tough and you are doing a great job! Thanks for sharing. I don't have kids, so your post was so eye-opening about the every day difficulties of being a parent. I really enjoyed reading your post and about your day. Thank you for sharing! Reading your post took me back a long way, to when my son was a preschooler--the joys, and the struggles, sound so familiar. You are so honest about it all, Wendy--this is SO much more than an accounting of your day. Thanks so much for sharing it! Florinda - I am sure many can relate to the mood swings of preschoolers. I'm loving this age though. I wish I could keep her from growing older too fast. These posts from moms like you put me in awe of all of you for being able to maintain active blogs on top of everything else! I'm inspired by your post to try to do more. As an empty nester and not yet a grandparent, I should have plenty of time to do more blogging but I don't ever seem to! Laurie - The key is pre-scheduling everything blog related. LOL I used to be able to blog the night before, but it's rare now. I definitely don't blog as much as I used to. It's not always easy to fit in blogging even when you do not have children at home anymore, I imagine. You have other things going on, other priorities, I'm sure. LOL at "We won't be doing that again" -- what a calm response. I'm guessing she picked that up from her parents -- good for you! Cute photos! What a lovely piece you've written here. You and Mouse will come to treasure it when she's older. Joy - She amazes me with the things she says sometimes, but, yes, a lot of it does come from my husband and I when I think about it--or from her teacher at school. It's interesting what children pick up on. How nice is this! And I liked getting to "see" a day in your life. You get up so early for work! I'm up around 6:00am and really am not fully awake until I have my coffee. Isn't it funny how the kids don't want to go to sleep? Mine are teens and they still try to bargain with me...lol. Have you seen Samuel Jackson's Go To Sleep? If easily offended, don't google it, but it cracked me up! Naida - I only get up so early to work out. Mornings are the only time I can do it. Otherwise, I would get up at 5:30 a.m. every morning. Still too early, if you ask me. Thank you for sharing so much about your day (even the scary things like the car situation -- I'd be freaked out too!). You're up very early, long day. But lots of great things in it too. I love the time you get to spend with your daughter after school. Kim - I can still feel the panic from that car situation--but I also can laugh about it now, which is a good thing, right? I am sure I could spend my time after school and work more productively, but it works for us. I see her so little during the week. :-( And I'm sure these types of days will become more busy when she's older. Thanks for sharing your day! Your daughter sounds like a real sweetheart. (but I'm with you on the bed time crankies. That's hard to deal with) And you are amazing for making it through such long days. I can't even imagine waking up at 4:30, let alone getting in some exercise. High fives to you! Kathy - She is a sweetheart. And a troublemaker when the mood suits her. Haha! Yes, bedtimes can be really difficult to deal with. Especially when I'm tired too. Ouch waking up at 4:30 sounds painful. I can't even handle 5:45 lol. I know we discussed you not following the "directions" on twitter, but can I just tell you that I love the way you wrote this up? The car thing ... When Garrett was a little over a year old, hub locked him in his truck in my grandmothers driveway. He thought the keys were in the truck, but turns out they were inside the house on the kitchen counter the entire time. Oops. The cops came. My dad took some tool and tried to break out a window, only managing to do $800 in damage to the truck. And the keys were inside the house the entire time. Funny now, but very, very scary at time time. Thanks so much for sharing up your day. It was a joy to read. Tara - Ah, thanks! Oh my gosh, how scary! And isn't that always the way it goes, with the keys not far away? I worry about something like that happening with me leaving the keys in the car now that we have a "keyless" key. I've already locked myself out of the car three times in the past three months. I would die if Mouse were ever in the car when I did. I think that's one of my worst fears. I am glad it worked out though, even at the cost of $800. "As strong as the urge is to run to her every time she calls me, I am not sure it's the best idea. I feel torn between wanting to meet her needs and help her feel secure and in wanting her to be independent and not rely on me so much." I will have to try talking to my older boy about my day when I pick him up from preschool, the way you did with your girl. He seldom says anything about school and my questions don't get more than monosyllables! 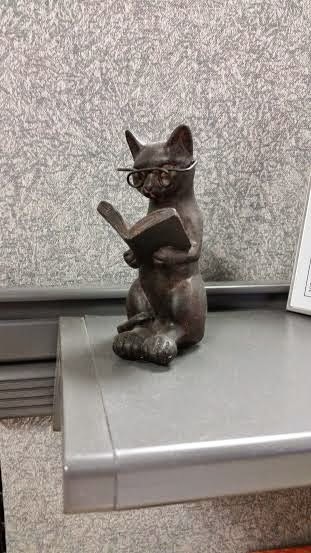 Oh and I love your reading cat statue! Sharlene - That's so nice of you to say, thank you. I feel your pain with your near two year old. Sounds like we have similar problems in that regards--it's so hard to resist running to them when they want us. Good luck with your older son and trying to get more out of him about his day. That's much how my daughter is with me--monosyllables. It's like pulling teeth to get anything out of her. I was so happy when I discovered talking about my day got her to open up--I hope it lasts. With these kids, what works today, won't work tomorrow. You know, I'm sure. It is crazy what we do just to keep our lives running smoothly :) Great post! What, no report requests? ;-) I love how much introspection you included in how the day went and how much insight we got into Mouse's character (so much her own person) and yours. I'm sure your job really plays into that...I've known quite a few workers who have quit after they had kids because they just didn't want to see all that on a daily basis. So huge kudos to you for sticking with it and being such a calm person on the job and at home. I think if I was still a field worker I might consider a different occupation. I can't imagine doing anything other than what I'm doing right now. Although, I sometimes dream of working in a library or bookstore . . . Thank you for your kind words! First of all, many thanks for posting your post a day ahead. Your post is actually what reminded me that I wanted to write one, which is why I dashed off and am only getting back to actually read it now! Sounds like being a parent of a kid who wants to do her own thing could get a little frustrating, but I loved reading about how you take the time to sit with her and talk to her and draw out her growing personality. I know she'll appreciate knowing she can talk to you, even if it's in her own time, even when she's grown up a bit. I love that you're the co-worker who will randomly burst into song (so am I!). It's great to have good co-workers that you can laugh with and enjoy even when the working gets a little rough. Glad you have some! Thanks so much for sharing your day (and reminding me to share mine)! Megan - Haha! I am glad I could help. :-) I am glad my daughter has a mind of her own, especially in our society. Although, yes, it can be frustrating. I do hope she'll know she can always talk to me--and I hope I will be patient enough to wait for her to be ready. Patience isn't always my strong suit. Can you imagine if we worked in the same office? We'd have a lot of fun together. Think of the concerts! I've always been a night owl so I can imagine I must have been like Mouse with my parents when it came to begging to staying up later! Thank you for sharing about your day and adventures with Mouse! Iliana - I was a night owl once upon a time. :-) Somewhere in there I switched the other side. I'm not sure when. Mouse definitely is a night owl though. At least she would be if we let her. She probably goes to bed way later than she should anyway, but that's mine and my husband's fault. This day was a trip down memory lane for me. I remember how it felt to be so needed. Now that my kids have left home, I have lots of time to spend however I want. 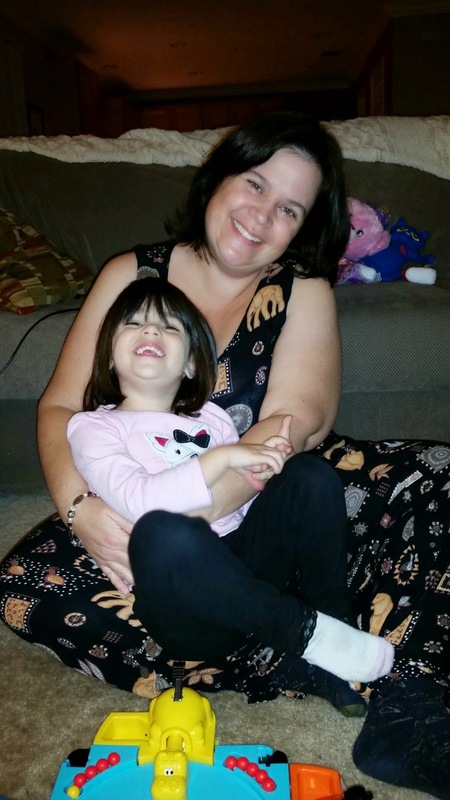 Jeanne - I love to feel so needed and know I will miss it when she's older and doesn't anymore--but I will also love having more time for myself again too. I love this. It brought back so many memories. Hang in there, sweetie! You are doing everything you are supposed to be doing, and there will come the day when you look at Mouse and realize you have inadvertently become each other's BFFs. It's a great feeling. Oh Wendy. I'm glad that I saved this post for when I could carefully read through the whole thing without interruptions over the weekend. You gave me chills, you made me teary-eyed, you made me laugh, and even gasp with the car incident. There have been a few times when I've gotten Evie buckled in and Elle will climb into her own seat and I'll jump into mine and she'll yell "Mommy!! You forgot to buckle me!" Sigh. I thank my blessings every single day that they are loving and forgiving beings. And I'll let you in on a little secret--I at times wish that I was the kind of mother that you are. Your love and devotion to Mouse is evident in everything that you do--and even the best mothers lose their cool and patience. You are amazing and incredible and I love how you documented your day for us. Trish - Your comment made me tear up, Trish. Thank you. I'm glad I'm not the only one who sometimes forgets to buckle her child in. Many of Mouse's older friends can buckle themselves in, which I sometimes wish Mouse could do (she can manage the top latch on her own, but not the bottom one). Then I think how easy it would be for her to unbuckle herself in that case--so for now, I'll be glad she can't! Much safer this way. I am grateful too at how forgiving Mouse is. This is such a great age, isn't it? Thank you again for your kind words. They mean a lot to me. This was a great post. It reminded me of when my daughter was little. Carol - Thank you. Part of me is excited about seeing the type of girl my daughter will be as she grows and reaches each stage in her life--and a bigger part is wishing I could hold onto this moment for as long as possible. I love this post. It really captures how I feel when interacting with my daughter-- a little bit frustrated that things aren't moving as fast as I want them to, a little bit go-with-the-flow and enjoy the time we have together, a little bit silly, a little bit I-don't-know-that-what-I'm-doing-is-right-but-oh-well. Thanks for sharing! Elizabeth - Thanks! You captured it in just one sentence! That's it exactly. Oh goodness, I know what it's like to raise one that has a mind of her own and is strong-willed. Just hold on to the idea that some of the things that make life difficult now will actually turn out to be very good traits in an adult. And cherish those bedtime moments! She will outgrow them before you can believe it. 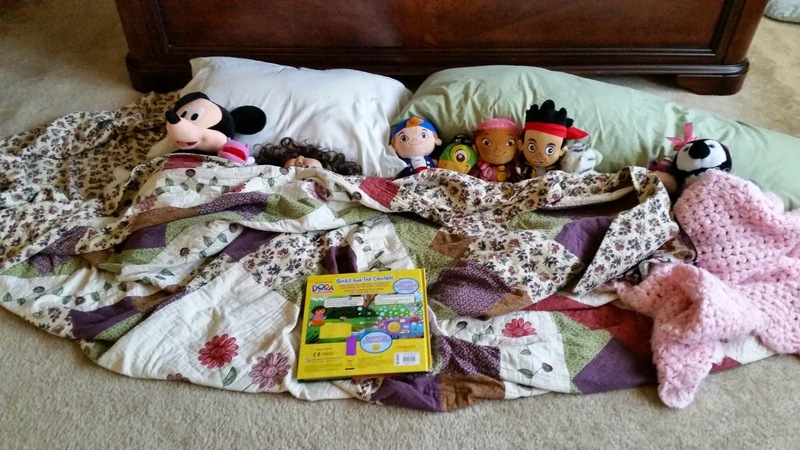 For a time, I had all three kids that I had to spend time with every night and it was a good hour of being stretched out in a comfy bed. I could hardly make myself do anything after they all finally fell asleep! But I can't tell you how much I missed it when they didn't need it any more or how much it set them up to know they could always come and talk to me. Lisa - I do hope she will grow into an independent and strong willed adult. I can't imagine having to fit in three kids at bedtime with the trouble I have with just one. I bet though I'd manage--you have to, don't you? I try to remind myself how much I will miss this stage when it's long gone, but that's hard to do when she's in the middle of a tantrum and nothing seems to sooth her.